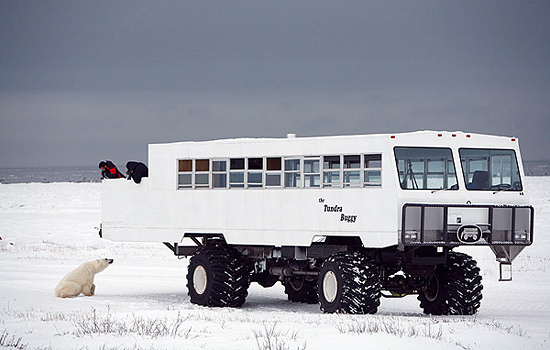 What is a Tundra Buggy, and why is it so popular with visitors to Churchill, Manitoba? Simply put, Tundra Buggies are the best way to explore the Canadian arctic and see the wide variety of wildlife that inhabit this area. If you and your family are planning a vacation near Hudson Bay, make sure you don't miss out on this unique and exciting opportunity! The polar bear has gained a lot of attention over the past few years sue to a growing concern about the species' future. According to many experts, at least 5 of the world's 19 polar bear sub populations are disappearing. It is believed that human activities have led to an increase in annual, global temperatures. As a result, the sea ice that many bears call home has started to vanish. These findings are alarming, and many are feeling the urge to see polar bears in their natural habitat before it is too late. Luckily, Churchill (also known as the "Polar bear Capitol of the World" and its surrounding area are used as migration paths for over 1,200 of these beasts. The Tundra Buggy offers tourists a chance to travel great distances and get a safe look at hundreds of these magnificent creatures. Why Should Visitors Use The Tundra Buggy? Safety is key when in the presence of polar bears. Popular culture portrays the animal as cute and cuddly (think of Coca Cola's Christmas ads as an example). In all actuality, these are the world's largest land carnivores, and they can be extremely dangerous if approached without the proper precautions. Polar bears are neither territorial, nor overly aggressive. A well-fed bear will rarely attack a human. But if the animals are hungry (such as those that are migrating through Churchill to find a winter meal) they could act spontaneously. Polar bears have killed and eaten humans in order to survive. The Tundra Buggy offers people safe passage through the Polar Bear's domain. The tires of the vehicle are heavily treaded and stand 5 and 1/2 feet tall. This ensures that the Tundra Buggy can move safely over arctic snow and ice and keeps passengers safely out of a polar bear's reach. The body of the vehicle is very wide and allows people to get a clear view of their surroundings on either side. Guests are invited to stand on the open-air back end of the Tundra Buggy during stops. This allows you to safely get the closest view possible of a polar bear in its natural habitat. Canada Polar Bears offers some great packages that feature rides on the Tundra Buggy. Take a look through our Canada vacation plans to find one that works for you and your family. If you can't find your dream vacation on this list, we can help you customize your dream tour of Churchill's wilderness. Need more information on Polar Bear Tours on a Tundra Buggy? Talk to one of our Canadian travel Insiders who'd be happy to answer all your questions.